Mazel Tov on your upcoming Bar or Bat Mitzvah! We at Lynn Osband Events are here to take the stress out of planning and executing your big event! 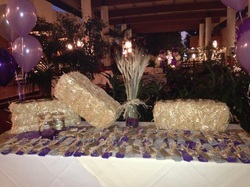 We are experts at Bar/Bat Mitzvahs! Whether you are having your service at a synagogue or hiring a private spiritual leader, we can coordinate all the details. Simple party, elaborate function or something different, we can make sure your event is exactly how you envision it. Contact us today at 408-981-8422 or LynnOsbandEvents@gmail.com to schedule a Consultation where we will give you ideas, vendor suggestions and put you on the right track to planning a meaningful and fun event for your family. Tip: Make sure your Event Planner is coordinating the DJ and kitchen timeline so the kitchen doesn’t put out a candy bar or chocolate fountain when the DJ has the kids all lined up for the next game with props, positions, etc, otherwise the kids will run off to eat and ruin all the work the DJ took to set up the kids for the game. Message to DJ’s: You're welcome!